Like it or not, speaking is part of the author’s overall marketing toolbox. With her new book From Page to Stage, Betsy Graziani Fasbinder offers excellent advice for becoming a better advocate for your book, whether on the stage, at an in-person reading, or on a podcast interview. In today’s publishing environment, authors of all types must speak up for their works. Resist the temptation to hide in your written words. 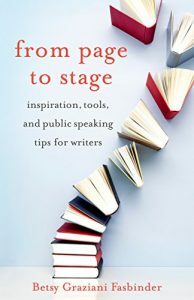 Now you’ve got a great guide in this new book from a coach who works with authors: From Page to Stage: Inspiration, Tools and Public Speaking Tips for Writers by Betsy Graziani Fasbinder. The book makes a compelling case for why authors benefit from speaking in a variety of situations. When you are comfortable and effective speaking with others, you represent yourself and your work well, reaching potential readers and advocates. Showing up at events helps you connect with other authors. And as Fasbinder points out, writers can help or harm their causes by the way they speak. A quick story reinforces this point. I first heard Betsy Graziani Fasbinder speak at the San Francisco Writer’s Conference in 2017, and was impressed with her expertise and approach. So when I heard that she had a new book coming out, I eagerly said that I’d review it – even though the book’s publication date is exactly two days before my own book’s publication date. Her effectiveness as a speaker earned my admiration and support. 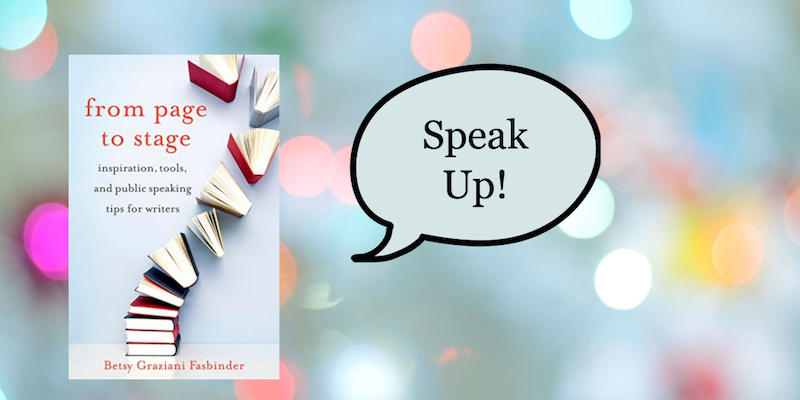 This review is proof of her thesis that public speaking can help your book find its fans. Fortunately, public speaking skills (like writing skills) can be learned and practiced. And Fasbinder is a terrific guide. As an author herself, as well as a coach who works with other authors and a certified psychotherapist, she knows whereof she speaks. Simply reading it won’t make you better a speaker. You’ve got to try things out and learn from others. The book includes numerous suggestions to try, and directs you to specific online examples so you can figure out what the most effective speakers are doing. In addition to knowing her stuff, Fasbinder communicates effectively. She illustrates her story map method with a specific, memoir-related example, so it’s easy to see how abstract instructions translate to the real world. She shares personal anecdotes to prove her points, and offers exercises and mnemonics to help you master and remember her approach. There are other books about public speaking skills. This one has the benefit of focusing specifically on writers. If you want to share your ideas and stories, don’t stop with the written word. Use this book to polish your spoken delivery as well. Want to read more posts like this? Sign up to receive writing posts by email, every other week. You'll also receive a guide to overcoming common barriers to writing.